A lot of new turtle keepers don't realize this, but female turtles produce eggs even if there are no males around. The eggs will be infertile and will not hatch, but all healthy adult female turtles produce eggs. When a turtle is carrying eggs, she is said to be gravid, not pregnant. I used the word "pregnant" in the title tag only because that's what most new turtle keepers search for when looking for information about this topic. It's really not the right term. So from now on we'll use "gravid." And unlike many amphibians, most species of turtles and other reptiles can't reabsorb unfertilized eggs into their bodies. When they have eggs, they have to expel them. If they don't, they can get "egg bound," which is also known as suffering from egg retention or dystocia. Dystocia isn't just painful for the turtle. She can die from it. Lack of the kind of place the turtle is looking for as an oviposition (egg-laying) site. Turtles are very particular about where they lay their eggs, and many turtles simply won't lay them unless a suitable place is available. This is the number one reason for dystocia in captive aquatic turtles. Stress from living in a tank that's too small, too overcrowded, doesn't have the right temperature or lighting, or has poor water quality. The presence of other animals that would be predators in the wild, such as dogs or cats, can also cause turtles not to lay their eggs. Improper diet, especially inadequate calcium. Anatomical problems (problems with the turtle's internal or external reproductive organs). The most common reason for egg binding in gravid captive turtles, however, is lack of a suitable place for the turtle to lay her eggs. In nature, aquatic turtles lay their eggs on land in a particular kind of soil or mud, depending on the specie, when the season is right. Keepers of captive turtles need to provide as close as possible to a natural oviposition site as their turtles would seek in nature. The turtle's eating habits change. Most gravid turtles will eat less or stop eating altogether because they are focused on finding a nesting site. But some turtles will eat more than they usually would. The turtle's basking habits change, or the turtle tries to escape from an above-tank basking area. 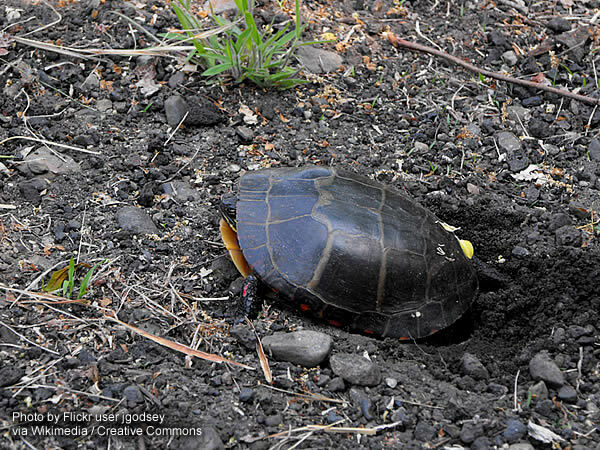 The turtle tries to dig a hole in the substrate or in the bottom of the tank or basking area. If she uses her hind feet to dig, then it's especially likely that she's gravid. A veterinarian or an experienced turtle keeper can palpate the turtle's abdomen by gently feeling the area forward of her rear legs with their fingers. This is something you shouldn't do unless you've been shown how by a veterinarian or experienced keeper. If you break the eggs, the turtle could suffer an infection known as yolk peritonitis, which is usually fatal. The advice here is general in nature. Every specie of aquatic turtle has their own breeding and egg-laying habits, so I suggest that you look up your specie of turtle in the Care Sheets on Austin's Turtle Page for more detailed instructions. But here are some general instructions. Captive turtles who live indoors may need to lay eggs at unusual times of the year because they often lose track of what season it is. Wild turtles are believed to use factors such as the temperature, the angle of the sun and moon, the length of days, and possibly the appearance of various stages of vegetation to know what time of year it is. These cues are missing in most indoor turtle habitat. 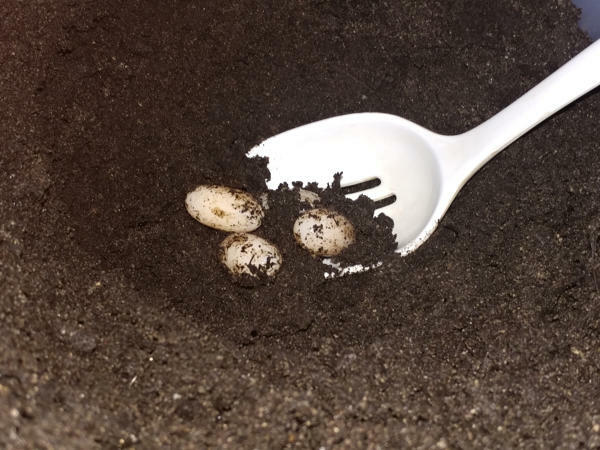 As a result, captive turtles may need to lay eggs during times of the year when it's impossible to provide an oviposition site outdoors, which is usually the easiest way to do it. This leaves you, the keeper with several options. One is to try to provide a suitable oviposition (egg-laying) site indoors. This is not as difficult as it sounds. 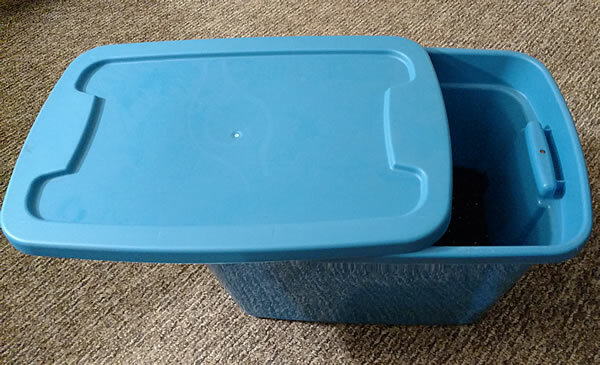 You can either purchase a turtle nesting box, or you can just use a plastic storage tub. It will have to be large enough to hold enough soil that the depth of the soil is deeper than the turtle is long. It also should be long and wide enough for your turtle not to feel too boxed-in, which may stress her and discourage her from laying eggs. I've found that it's best to use a tub at least five times the length and width of the turtle's carapace. The procedure is pretty simple. First fill the container with an adequate amount of the right kind of soil for your turtle. This is usually a mixture of topsoil or potting soil and sand, although it varies by specie. Make sure the soil you use doesn't contain any fertilizers or pesticides. Most brands that are labeled as "organic" won't. For the sand, you can use either aquarium sand or play sand. Choose a natural color to avoid dyes. If you buy your soil and sand locally during the winter, make sure to let it warm before using it in your nesting box. Once you mix the nesting soil, lightly spray the top of the soil with a clean spray bottle of warm tap water, and place the turtle in the box. Depending on the turtle specie, you may want to cover the top about two-thirds closed with the lid or a piece of cardboard to simulate twilight, cover it completely to simulate nighttime, or leave it open and put a basking light over it to simulate daytime. You're basically trying to simulate the conditions in which your turtle would lay eggs in the wild. Then leave her alone for a few hours in a warm room with no people or animals to disturb her. Once you think she's done (or after two or three hours at most even if you don't think she's done), put her back in her regular habitat and check the soil for eggs. They will be buried underground for most turtles. The eggs in this picture were from one of my Southern painted turtles. The eggs of other species may look a bit different. If you find any eggs, throw them away if they are unfertilized (which, of course, they will be if your turtle doesn't have a male in her habitat). Keep an eye on your turtle for a few days, however. She may have more eggs to lay. If she shows signs of needing to lay eggs, then put her back in the nesting box so she can do so. If you don't find eggs, wait until your turtle looks eager to find a nesting area again, and put her back in the box. If she still doesn't lay eggs after several tries, then there's probably something she doesn't like about the nesting area. The most common reasons are the soil mix, the temperature, and the amount of moisture. Research your turtle's natural nesting habits again and try to simulate them as closely as you can. You can also try placing the turtle in a small tub of warm water, about 10° F (18° C) warmer than the water in her usual tank, in a room that's also warm, for a half hour or so; and then place her back in the nesting box. Sometimes that will help her to lay her eggs. If your turtle still won't lay her eggs after a few days, then it's time to call a veterinarian who's knowledgable in treating reptiles (often called a "herp vet"). Sometimes the vet can help you correct any problems with your nesting area. Other times he or she will want to inject your turtle with one of several drugs that can induce egg-laying, such as prostaglandin F2 alpha (Lutalyse) or oxytocin. If the drugs don't induce the turtle to lay her eggs, then the vet will need to surgically remove them. If your turtle does have a mate and you want to raise the eggs, the Care Sheets at Austin's Turtle Page have good instructions for incubating the eggs of most aquatic turtle species. Read the instructions before you touch your turtle's eggs. What's most important is not to ignore your turtle's signs that she is gravid and needs to lay eggs. If you do, your turtle will probably die. So try the instructions above, and if they don't work, call a veterinarian who treats reptiles for expert help.